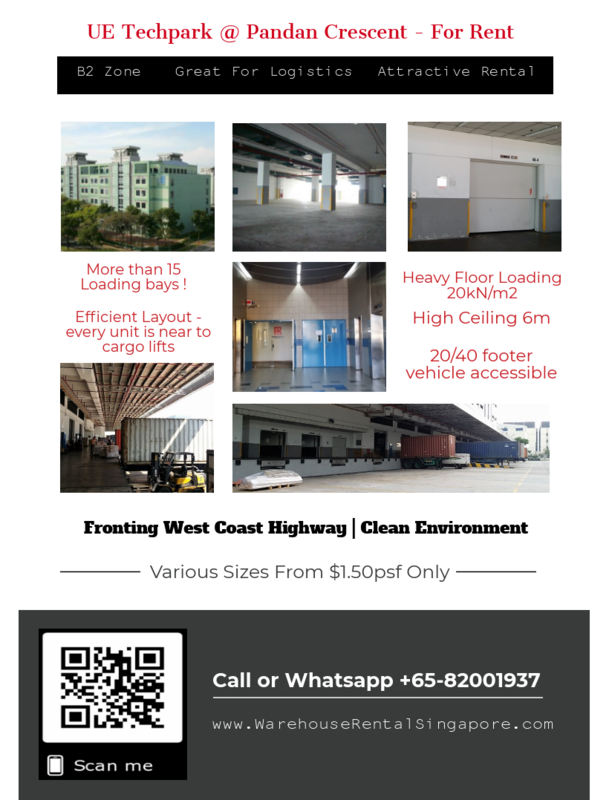 Home Feature - B2 Factory / Warehouse B2 Factory For Rent @ 8 Pandan Crescent – 40 Loading Bays! B2 Factory For Rent @ 8 Pandan Crescent – 40 Loading Bays! UE Techpark @ 8/10 Pandan Crescent (District 5) is a B2 zone industrial building with good corporate image facade. Due to its excellent loading/unloading facilities with more than 15 loading bays, it is suitable logistic, general warehousing, distribution trade and production company. It has a clean environment even though it’s a B2 zone. Squarish units with dedicated 2 cargo lifts of 5 tonnes each. Efficient project layout to accommodate loading/unloading convenience. Fronting West Coast Highway and close to AYE, Jurong Town & Clementi. Plenty of car park lots. Great layout. All units are near to cargo lifts. Call Meiti at 82001937 for discussion.